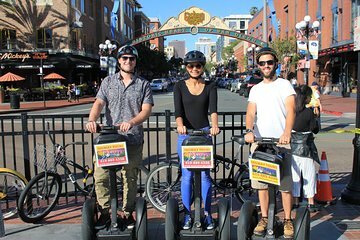 Verken het centrum van San Diego en het Balboapark tijdens een 2,5 uur durende Segway-tour. Volg je gids naar historische bezienswaardigheden zoals de Hal van Justitie en het Pantoja Park, en baan je een weg door Little Italy en het uitgestrekte terrein van Balboa Park. In het park glijd je langs bestemmingen zoals Founder's Plaza, het San Diego Museum of Natural History en de Inez Parker Memorial Rose Garden. Je gids geeft gedurende de hele tour commentaar op de geschiedenis en bezienswaardigheden van San Diego. Inclusief gids, gebruik van apparatuur en Segway-oriëntatie - geen voorafgaande ervaring vereist. this was a very fun adventure for my wife and me. Hugh was a great tour guide and teacher. My wife and I are in our mid sixties and have never been on a Segway before and Hugh made us very comfortable and made sure we understood the principle of how to operate the Segway safely. He had 6 out of 8 people that had never been on one before and he had all of us riding in 15 minutes. We were crossing intersections and he made sure we had no problems. We had FUN and will be doing Segway tours more often. I highly recommend this mode of touring! Thanks Hugh for a great job!! Excellent experience. Segways easy to learn. Balboa Park exceptional place to visit. Tour guides accommodating to group --- answered all questions or found answers. Low-cost Valet Parking at Hotel was included and provided additional benefit of extra time to walk in area for several hours after end of tour. This was a fantastic and fun way to see and learn about Balboa Park. There were about 20 people signed up for the tour but we were broken up into smaller groups so our family of 4 had our own tour guide who knew a lot of fun facts along the way and in the park. The early morning time slot is great because there was not much traffic or pedestrians out at the time. Probably my favorite vacation activity. Was a great trip. Hugh definitely new what he was doing. Great introduction to Balboa Park. Our grandsons loved it. We went on a Sunday morning when the streets were very quiet. They said their guide was informative and hilarious! Our tour guide Hugh, was very enthusiastic and the entire trip starts out from the Harbor area, through the Gaslamp Quarter and every which way and all over Balboa Park. We had been in Balboa Park numerous times, but on a Segway and a good tour guide like we had we got to see more nooks and crannies as well as the better recognized places. The weather was perfect for us as well.